Buggies on Henry Miller's property in Whitefield. The horse-and-buggy is the primary mode of transportation for the town's growing Amish community. In March 2017, three Amish families moved into Whitefield. Today, the population has quadrupled. The town is home to 13 Amish families, about 50 people in all, and another family is on its way. Though two of the families are from Kentucky and the newest family is coming from Michigan, most moved to Whitefield from upstate New York. Henry Miller and his family were among the first Amish people to move to Whitefield. Before moving more than 400 miles to his son’s property on Route 17 in Whitefield, Henry lived most of his life on a settlement in St. Lawrence County, New York. He said about 300 families live there. The town has welcomed the newcomers. Within the last few months, new families have moved to the area. Many of the new families are of the Old Order Amish. According to the National Committee for Amish Religious Freedom, the group originated in Switzerland in the early 16th century and fled Europe because of religious persecution. John and Melinda Miller and their seven children moved to a property behind the North Whitefield Superette in April for reasons similar to Henry and Lydian Miller’s. John, who was from upstate New York, said Whitefield offers more opportunity for his children to buy land and more earning potential for his sons, who build and refinish home interiors. Noah and Lizzieann Hostetler, who have four children, moved to the area in June, mainly to be closer to Lizzieann’s family. Her family lives in Fort Fairfield, in Aroostook County, home to an 11-year-old Amish community that also continues to grow. Many of the Amish families in Whitefield have their own trades, separate from their work on farms and gardens. Henry builds picnic tables and swings from fir and finishes them with a cedar stain. John makes lawn chairs and jewelry boxes. Along Route 126, Noah sells sheds made of pine and spruce under the name NL Sheds & Cabins. He has sold 13 since moving to town. “You find a lot of people with a natural way of living,” he said. Henry and John said the other Amish families have been very hospitable. When a new Amish family moves in, the others find out through word of mouth and show up to help their new neighbors unload their belongings and build any workshops or barns needed on their property. Newcomers are also welcomed into the growing community through weekly church gatherings. Community members host the gatherings in their homes on a rotation. The Whitefield community does not have a minister, but a minister from Fort Fairfield periodically attends. The families also do not have a schoolhouse, but Henry said one will be built eventually. School is taught from grades one through eight, and takes place now at a red house on Route 218. Whitefield’s non-Amish residents have also been helpful to the arriving families. Henry and John said some come by not only to purchase food or handmade items, but to talk with the families. John said he has had people drive him into town, while Noah has a neighbor who helps him unload sheds at customers’ houses. 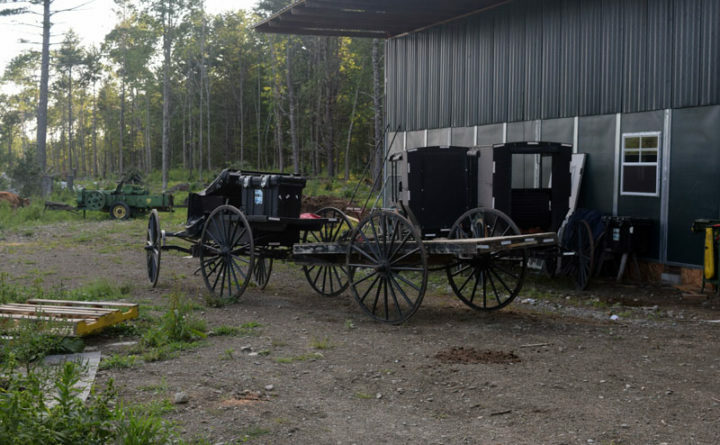 The town government’s interaction with the Amish community has centered on safety and avoiding car and horse-and-buggy collisions on the winding and hilly roads. Yellow horse-and-buggy signs remind motorists to be aware and share the road. However, most of the families do not think road safety is a major issue. Whitefield will tack on a 14th family when Anna and Ben Zook and their eight children move into town at the end of August. The surrounding families have said they are ready to assist. As for the future of the Amish population in Whitefield, John and Noah expect it to continue to grow.